Its Native Tongue Facing Extinction, Arapaho Tribe Teaches the Young About 22 children from pre-kindergarten through first grade started classes at the school—a rectangular one-story structure with a fresh coat of white paint and the words Hinono’ Eitiino’ Oowu’ (translation: Arapaho Language Lodge) written across its siding. Here, set against an endless stretch of windswept plains and tufts of cottonwoods, instructors are using a state-approved curriculum to teach students exclusively in Arapaho. All costs related to the school, which has an operating budget of $340,000 a year, are paid for by the tribe and private donors. Administrators plan to add a grade each year until it comprises pre-kindergarten through 12th-grade classes.And:A group of Arapaho families had sent their children to a pre-kindergarten language program for years, but it was not enough. Heeding Ms. Cedar Tree’s words, the tribe began using Arapaho dictionaries, night classes, CDs made by the tribe, and anything they could find to help resuscitate the language. 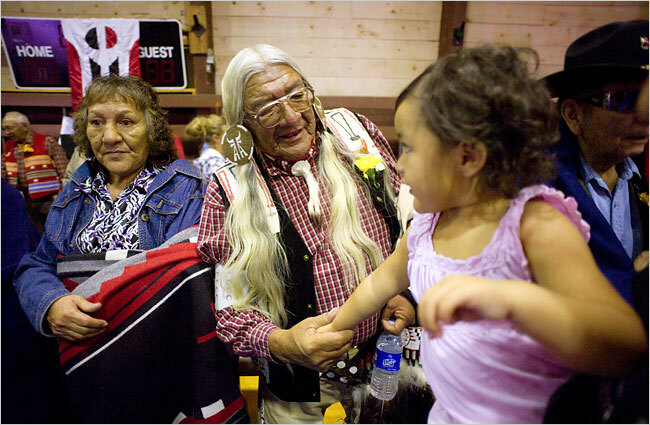 In the end, “we knew in our hearts that immersion was the only way we were going to turn this around,” said Mr. Wilson, a member of the Oglala Lakota tribe. North Slope Inupiaq language teachers stress oral fluencyOver the last several years all of the Inupiaq teachers received training in the accelerated second language acquisition methodology from Dr. Stephen Greymorning, professor of Native American Studies at the University of Montana. Teachers use images to teach a sequence of skill sets that require learners to produce the language, and facilitate the internalization of the way the language works. The method requires that teachers speak only in the language when they are working with children. Translation into English is not allowed which means that teachers need to use the images, as well as gestures and body language, in order to facilitate comprehension.